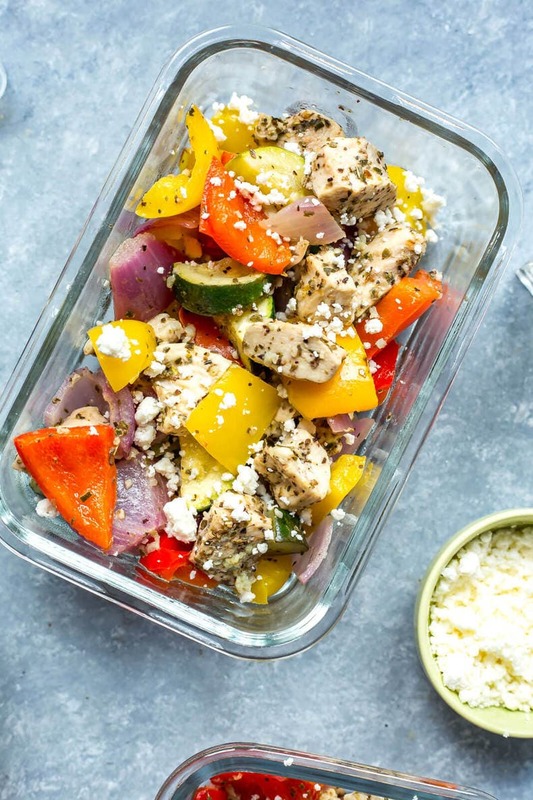 These Sheet Pan Greek Chicken Meal Prep Bowls are a low carb make ahead lunch idea seasoned with a simple lemon-oregano marinade, and they're ready in just 30 minutes! Let me just blow your mind with my latest meal prep idea. It's so easy, it's almost hands off. 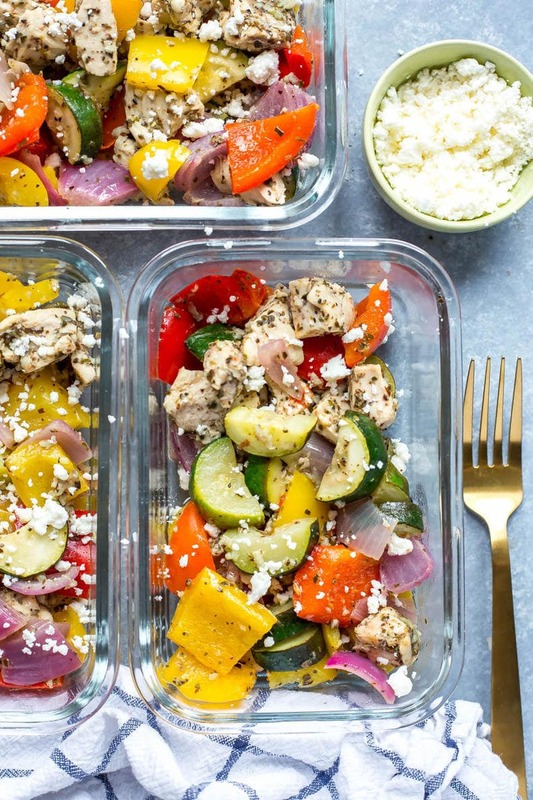 You do a bit of prep, mix together a few simple ingredients you likely already have on hand at home and boom, your lunches are ready to go for the week. 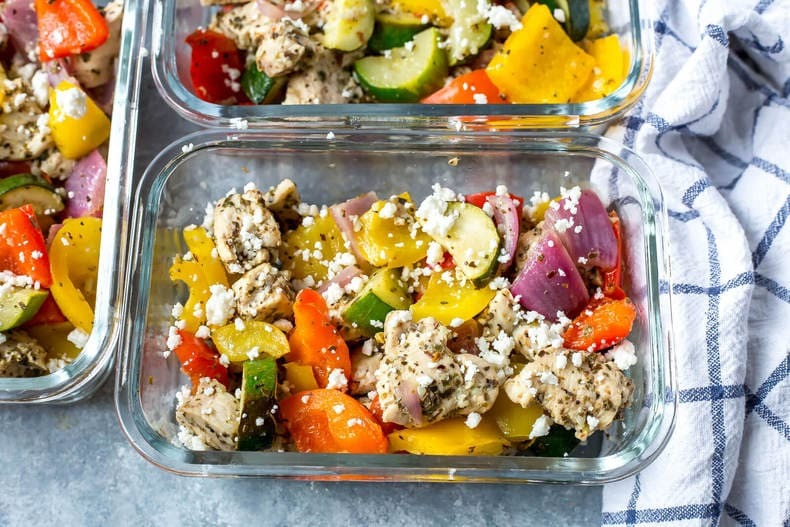 These Sheet Pan Greek Chicken Meal Prep Bowls are made on one pan, then you basically divide everything up between four meal prep bowls and you've only spent about 30 minutes in the kitchen. Isn't this way better than grabbing takeout for lunch at work? I personally like to save my fancy cheat meals for the weekend hehe. 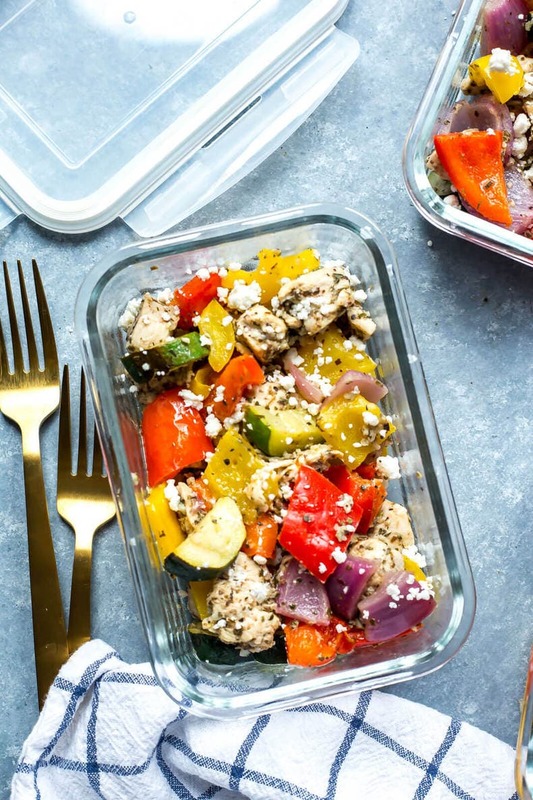 These Sheet Pan Greek Chicken Meal Prep Bowls are a delicious way to keep lunches simple, and they're also great as a last minute dinner that's packed with protein and healthy veggies. 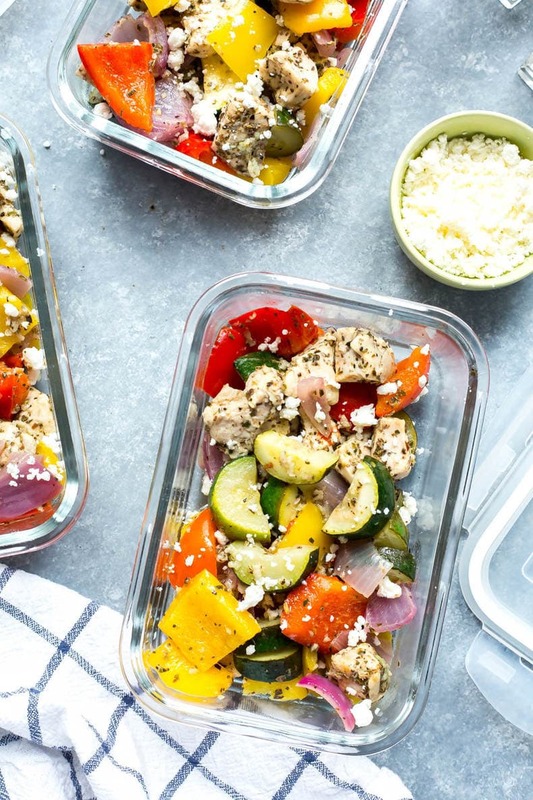 And even though they are similar to these Chicken Souvlaki Meal Prep Bowls I promise you this recipe is a MUCH easier version with less steps and all the flavour! I used bell peppers, zucchini and red onion to keep things simple but you can always sub in other veggies like broccoli, mushrooms, green beans, sweet potato and more – the options are endless. I was actually going to add potatoes to the mix because my mom makes these killer lemon-oregano Greek-style ones that are sooooooooo delicious and part of the Greek chicken dinners she makes on the regular. However, and fellow potato lovers please don't hate me, but I have been trying to eat lower carb and get more veggies in (it's a personal challenge, I'm experimenting with my macros and fitness and all of that). If you are looking to do a potato version you could always try these Baked Greek Fries though – they are my FAVE and such a delicious weekend meal! But while I'm trying my best to eat low carb and packing in the veg, I also started thinking about the logistics of this recipe and how the potatoes have cooked unevenly with other sheet pan recipes I've made. For these Sheet Pan Greek Chicken Meal Prep Bowls I decided to skip the potatoes because I knew I would have to cut them up super tiny to cook at the same speed as the chicken and vegetables, and then I would have to rinse them in water to remove as much starch as possible, and it just seemed like a whole process. 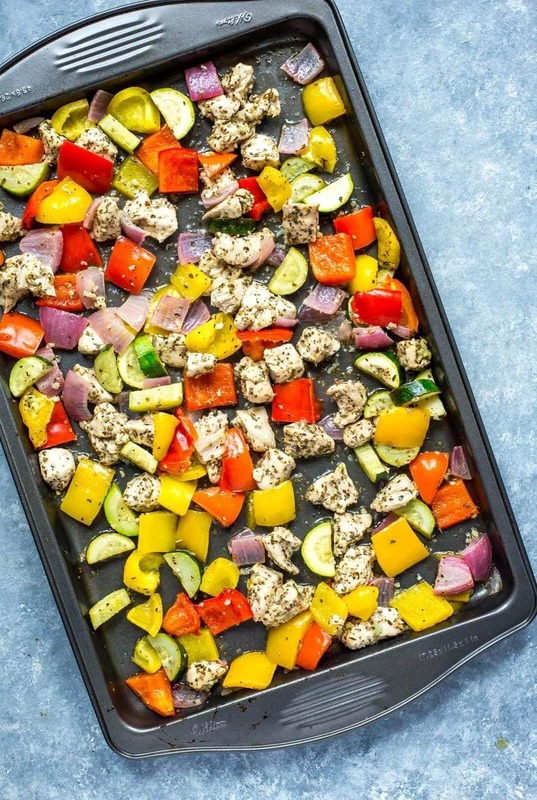 Honestly, veggies and potatoes don't do super well in sheet pan recipes from my experience. The veggies get overdone and soggy, and the potatoes remain hard and crisp. It's just not a good match. 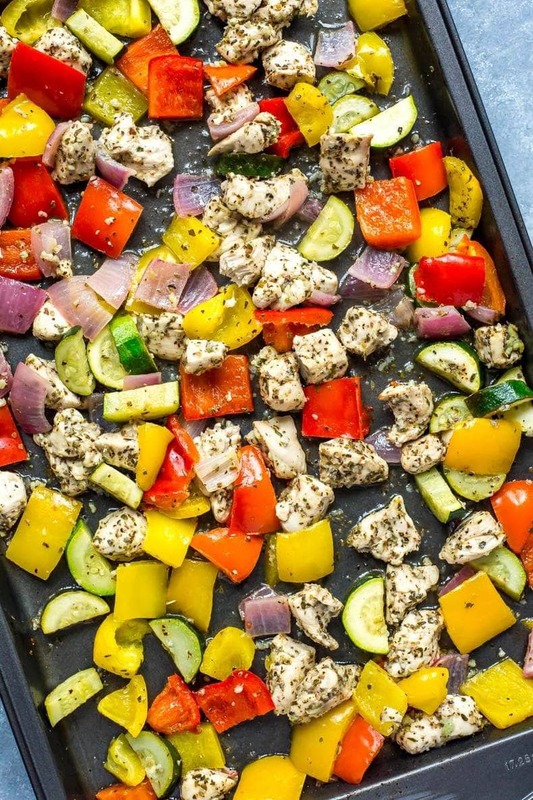 Besides the *science* of sheet pan dinners, I do love them for the simplicity. If you haven't tried one yet I'm telling you that they're a major time-saver, and you don't need a ton of ingredients or sauces to make them delicious. I basically used ingredients from my pantry/fridge to make the Greek dressing for these Sheet Pan Greek Chicken Meal Prep Bowls. Just a bit of olive oil, lemon juice, a TON of garlic, some oregano, salt and pepper. It's really a no-brainer and SO easy! You don't even need to mix it all up in a bowl and dirty another dish, you can literally measure and pour over all the ingredients and then toss everything together. I'm telling you, dinner doesn't get any easier than this. As for the feta cheese, if you would rather keep this recipe dairy-free that's totally possible, just leave it out! I make substitutions to recipes like this all the time – sometimes I'll throw in some hummus, other times some tzatziki or freshly chopped parsley. 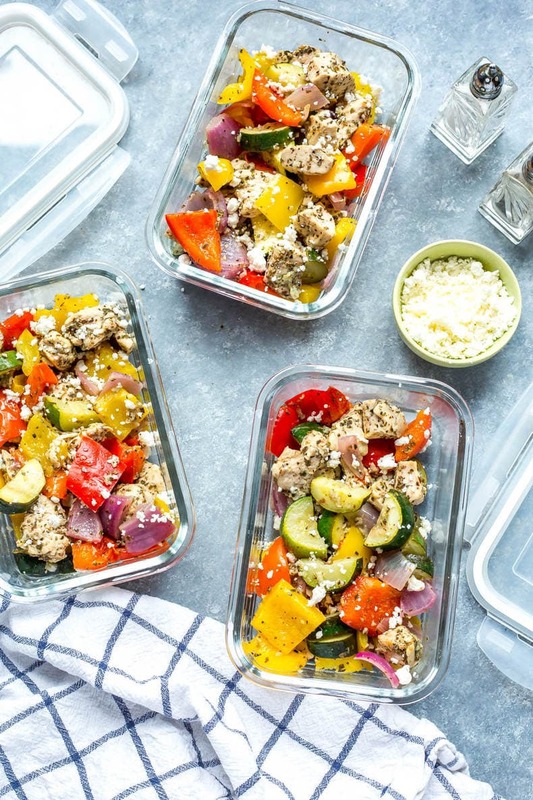 It really depends what you have on hand in the fridge but you don't really need more to up the flavour in these Sheet Pan Greek Chicken Meal Prep Bowls. A little lemon juice and some spices from your pantry can go a long way and this recipe's a good example of that! 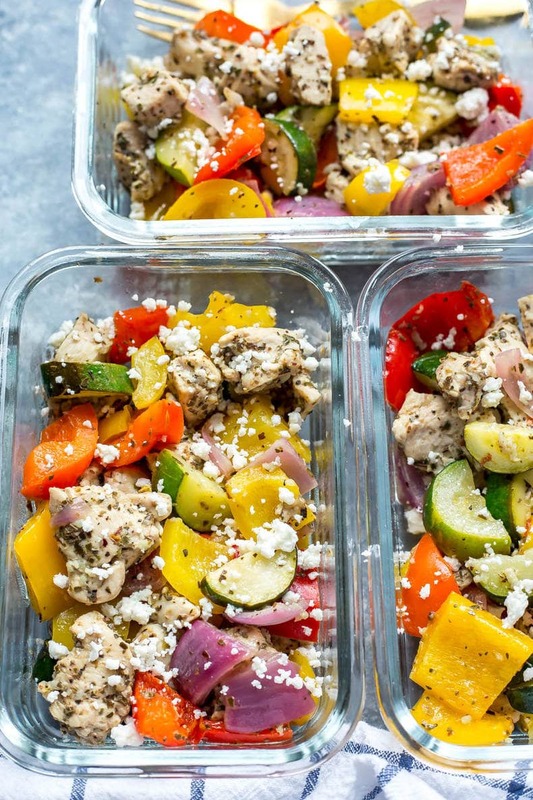 Will you be making these Sheet Pan Greek Chicken Meal Prep Bowls? I absolutely need more of this 30 minute meal prep in my life, it just makes life so much easier! Especially when you can save money and time at the same time! Preheat oven to 400 F. Add all ingredients except for feta to a large sheet pan and toss well to combine. Bake in oven once preheated for 18-20 minutes until chicken is fully cooked. Remove from oven and divide mixture among 4 glass meal prep bowls. Top with feta cheese (optional) and serve. Keeps in fridge up to 5 days. I have been watching these great pan meals that you have on your site. Do I heat them up for lunch or eat them cold? Thanks. Oh my, these came out so good! I forgot the feta the first day and was still fine, but with the feta was amazing. Thanks for a great recipe. I have follow up questions. Do you add the feta to each bowl and then heat it up with the feta in it? Or do you eat these cold? Or would you recommend adding the feta after reheating? So I punched everything into MyFitnessPal and got 202 calories. I think I may be using less chicken? How much does 3 chicken breasts weigh? That aside, holy crap this is the most delicious thing I have ever eaten. I made some wild rice to put on the side. I’ll be making this all the time! I’m not a fan of cooking, but I’m trying to eat healthier meals at home. 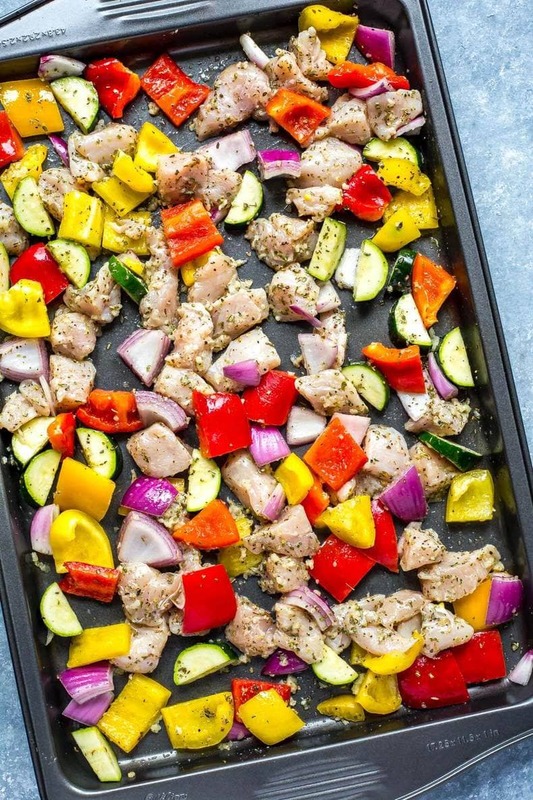 I love your sheet pan meals and they are so easy to make! 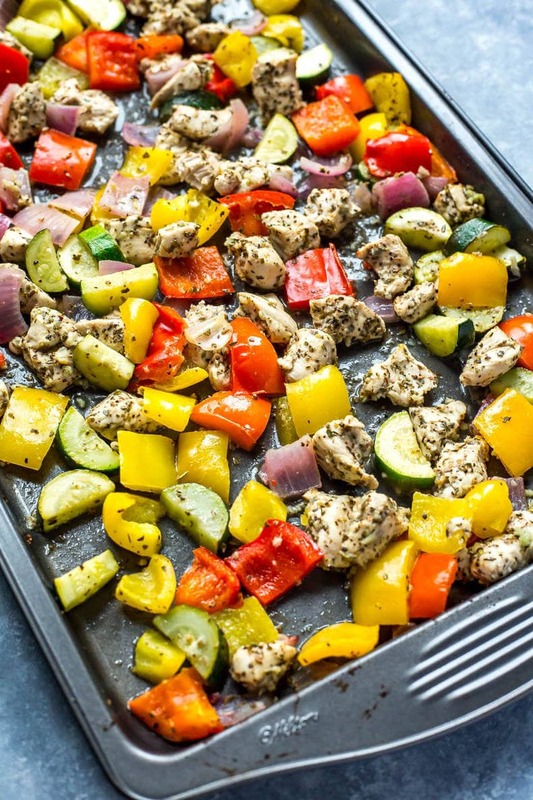 My husband has been my guinea pig… I’ve made a low-carb lasagna, sheet pan Greek chicken meal (twice) and a sheet pan teriyaki chicken with pineapple. My husband said these meals are all keepers, I actually enjoy making them and they burst with flavor. Thank you for making cooking fun and healthy! I’ve forwarded your recipes to several friends and look forward to following you on Instagram for more delicious meal ideas (especially low-carb)! So I made this for my first ever meal prep and it is amazing! I love it. It was so easy to make and just so tasty. Will definitely be using more of your recipes, thank you!! So happy you liked them Allison!! 🙂 Thanks so much for the kind words!!! Good morning! Your recipes are so easy and helpful for someone trying to eat healthier! I have one quick question…I don’t have any glass bowls to store the Greek chicken in but have a plethora of mason jars. Can this meal be stored in the mason jars also? Aww thank you so much Takyesha! Yes mason jars would also be great for storage! Just remember to bring a bowl or plate to work if you’d like to make it easier to eat out of! Oh. My. Goodness. This was AMAZING. My husband said it was phenomenal after the first bite. The whole family enjoyed it immensely, even my 15 month old. I made this one last night and the flavor was great, but there was a lot of liquid in the pan for some reason, making everthing vegetable-wise, soggy. Hey Chantene – sometimes this can happen if the veggies get overcooked and unfortunately this sometimes has to do with how hot your oven is (every oven is different so this isn’t always predictable). Sorry your veggies were soggy! How do you plug this into Myfitness Pal so it matches the numbers you have above? Hey Lauren – I’m not sure what you mean. The nutrition facts listed on the recipe should be very close to accurate for one serving size (aka 1/4 of the whole recipe). If feel the need to do your own calculations, you can plug in all of the ingredients listed in their entirety, then divide the total by 4 to get one serving size. This is so tasty! My husband and I love it and it’s super easy to make! The feta really makes this recipe pop! Thanks so much for sharing this! Holy moly this recipe turned out so so good. So much flavor! Thanks for sharing! Just made this and it’s so good! I’m trying to so hard to stick to meal prepping but other recipes out there I’ve tried, I get bored of eating it by day 3. Not this one! I will definitely use more of your recipes. They’re simple and flavorful. Thank you! I made this almost as directed and it was fantastic. I had to stretch the serving size from 4 to 6 to have enough for unexpected company. I added 1 green pepper, 1/2 red onion, 1 Tbsp EVOO, 1 Tbsp lemon juice, a couple of shakes of Greek seasoning spice blend (out of oregano), and about 3 handfuls of grape tomatoes (which I wouldn’t do again, makes things wet). I baked it for 30 min. to be sure the chicken was done. By the way there was more than enough chicken for 6 using the listed amount. Everyone raved about it. The next time I make it I may server both feta cheese and Greek tzatziki sauce on the side. Thanks so much for a great recipe.